The International Committee on Taxonomy of Viruses (ICTV ) has ratified in january 2018 the creation of 1 order, 7 families, 10 sub-families and 58 genera. ViralZone has been updated accordingly, and in taxonomy pages these new nodes are tagged as . The International Committee on Taxonomy of Viruses (ICTV ) has ratified in january 2017 the creation of 11 new families and 126 new genera. ViralZone has been updated accordingly, and in taxonomy pages these new nodes are tagged as . Virus complete genomes October 2016 A list of curated virus complete genomes has been gathered and cleaned up from several resources. The list for vertebrate viruses covers 78,725 viruses comprising 333,953 sequences. Strain names with accession numbers are available for download. Zika virus update February 2016 A dedicated ViralZone page has been created to describe the emerging pathogen Zika virus. This page includes basic information on the epidemiology of the Zika virus and links to its proteome and genome. 2015 ICTV taxonomy update November 2015 The International Committee on Taxonomy of Viruses has updated Virus Taxonomy in 2014, voted and accepted it in 2015 . 1 new Family, and 52 new Genera. Viralzone taxonomy has been updated accordingly, new taxonomic pages are marked by the logo. A HIV home page have been developed to describe the molecular biology of HIV and the effect of antiretroviral drugs on it. This resource is supported by the Swiss South Africa Joint Research Programme. New hidden genes have been discovered in RNA viruses. Orbivirus NS4 , Luteovirus and Polerovirus P3a . a process not observed in ss+RNA viruses before . In the swarm of sequence data and databases, how choosing a dedicated set of reference sequences for a given study? The page Reference sequence helps answering the question. Virus entry and virus exit have been updated. The Sphaerolipoviridae and Spiraviridae are noteworthy by many aspects: the first is family whose viruses are infecting archaea and bacterias, the last is family of single-stranded DNA virus infecting archaea. Electron microscopy (EM) images from the virions are now available in most fact sheet pages of tailed phages. They have been inserted into a slider that allows to navigate from the virion drawing to the EM image. We are very grateful to Prof. H.-W. Ackermann who kindly provided us with the electronic microscopy images of most reference phages. A recent paper: Unraveling the Web of Viroinformatics" describes more than 100 Web servers and databases embracing all or specific viruses. With permission we have used all this information to expand ViralZone links page and stored it in a searchable table. 2014 ICTV taxonomy update September 2014 The International Committee on Taxonomy of Viruses has released Virus Taxonomy: 2013, voted and accepted in 2014. 7 new Families, and 47 new Genera. Viralzone taxonomy has been updated accordingly, new taxonomic pages are marked by the logo. The structure of filoviruses nucleocapsid have been refined in 2012(PubMed ), and morbiliviruses nucleocapsid as well (PubMed ), and the ViralZone figures have been updated accordingly. Moreover an ebola virus cycle is available. The bacteriophages (Bacterial viruses) unique molecular biology is now described in 34 molecular virology pages. The content can be accessed by bacterial viruses homepage. One can discover the way M13 uses to enter cell cytoplasm by pilus retraction, the replicative transposition of Mu phage or the evasion of host toxin-antitoxin mechanisms of bacteriophages. Two replication cycles have been added: T7 phage and Mu phage The ViralZone team is thankful to Ariane Toussaint for her help. A new virus has been isolated in a 30,000-year-old ice core harvested from permafrost in Siberia, Russia. The Pithovirus infects amoeba’s and has a unique virion structure . A recent discovered amoeba’s Pandora virus has a huge genome compared to other known viruses . This fact may be related to amoebas having the biggest genome of all living cells. Their genome size would reach up to 670,000,000,000bp, that is more than 200 times the human genome size . In this context it is not surprising that amoeba’s nucleo cytoplasmic large DNA viruses like pandora virus can reach 2,470,000bp, which is about six times more than the biggest vertebrate virus, canarypoxvirus 359,000bp. A new page describes the Pandoravirus. 3.36 In formal taxonomic usage, the accepted names of virus Orders, Families, Subfamilies, and Genera are printed in italics and the first letters of the names are capitalized . A self-learning module for students has been developed in collaboration with FAO and IAEA about BLAST and multiple sequence alignment. The Host-virus interactions menu has been updated to reflect organism specific antiviral activity. By default the page displays vertebrate host-virus interactions, and gives access to invertebrate host-virus interactions, and Plant host-virus interactions. Bacterias host-virus interactions pages are under construction. The replication cycle of poliovirus is annotated and linked to virus ontology. ICTV February 2013 The International Committee on Taxonomy of Viruses has released many updates to the viral taxonomy in 2012: 9 new Families, 3 new Subfamilies, and 34 new Genera. Viralzone taxonomy has been updated accordingly, new taxonomic pages are marked by the logo. A new family of ssDNA virus infecting archaea has been discovered by Pietila et al in 2009. The family comprises now seven species and is tentatively named Pleolipoviridae. They are the first enveloped ssDNA virus described so far. A self-learning module for students has been developed in collaboration with FAO and IAEA about viral phylogenetic tree. The module comprises four chapters: Basics, Building Phylogenetic Trees, Interpreting Trees, and Exercices. In partnership with Hoffmann-La Roche, an interactive HBV life cycle resource has been created with 28 new pages linking to 180 publications from PubMed. 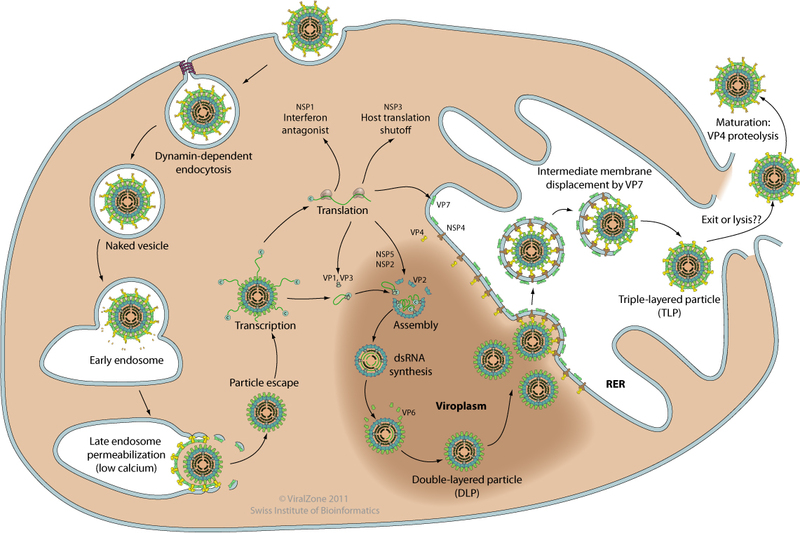 The entry point to the HBV resource is an illustration depicting the virus replication cycle in a hepatocyte. The cycle has been divided into 27 molecular events that gives access to specific description pages. An ontology that covers both virus structure and viral molecular events has been set up and can be accessed through the Viral molecular biology page. This viral ontology has been cross-linked in ViralZone pages to allow a better understanding of specific processes and characteristics of virus families. For viruses known to hijack or inhibit their host’s functions, complex relationships with the host are detailed in a new host-virus interaction section of ViralZone description pages. A new section describes the shutoff of host proteins induced by viruses, with subsection for the shutoff of cellular transcription, host mRNA suppression and host translation shutoff. More often than not viruses inducing a host gene expression shutoff are able to express their own proteins through specific mechanisms. For example many viruses inducing a shutoff of host translation have their mRNA translated through an IRES. The second edition of Fundamentals of Molecular Virology written by Nicholas H. Acheson is now available. It includes five new chapters and upgraded full-color graphics. We want to thank Pr. Acheson for having worked with us on few of these graphics, which helped us to improve virion representation in ViralZone. The entrez genome database hosted in NCBI has been redesigned with new data model, views and formats in November 2011. See the official news. Here is an example of the new view of the genome of human herpesvirus-1 RefSeq. The changes in genome adress resulted in several broken or misdirected links in ViralZone reference strains, This is fixed now. The Angela Belcher’s group at MIT is working with M13 viruses to perform detailed assembly work at the microscopic level. Having already published on virus-build batteries , they have now found a way to improve the power-conversion efficiency of solar cells using the M13 capsid as a scaffold . The first two parts are accessible: Host-virus interactions and virion. Within few monthes the last three sections will be released: virus entry, virus transcription/replication and virus exit. Protein data popups (example STAT1(M97935:9606) ) have been implemented for a quick protein overview from ViralZone pictures, for example on the picture of the MDA-RIG pathway. These popups have been developed in collaboration with Prof. Christian von Mering and Andrea Franceschini, Bioinformatics Group, Institute of Molecular Life Sciences, University of Zurich. Thanks to the user community for their support and precious feedback. Three tabs have been introduced at the top of ViralZone fact sheets to ease navigation: “General”, “Proteins by strain”, “Protein by name”. Additional tabs will support miscellaneous information, like replication cycle or epidemiology; see HIV fact sheet for an example. Endogenous Bornavirus gene in Human genome! A survey of mammalian genomes has unexpectedly unearthed DNA derived from ssRNA Bornaviruses, leading to speculation about the role of these viruses in causing mutations with evolutionary and medical consequences.